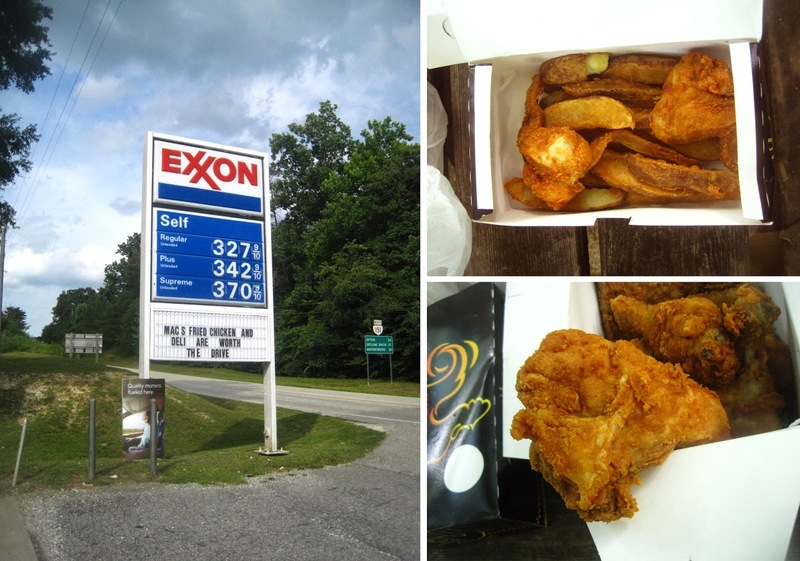 15 Years ago on a road trip to New Orleans we pulled off of I-95 and ended up at some gas station that had a weird little kitchen off to the side selling fried chicken and fried potato wedges (aka Jo-Jo's in certain parts of the world and Q-Mart). Being mostly vegetarians (yup) we skipped the chicken and loaded up on deep fried wedges and sides and after being in a car for 15 hours it seemed like the best food I had ever had in my life. Since then I've been dying to get back to a place like that for some real fried chicken. Driving down to Virginia to go camping I realized we were heading into deep gas station fried chicken territory. Picked up a box of chicken from the Roadfood-approved Wayside Market in Charlottesville which was really good, but didn't really have that gas station vibe I was looking for. Next up was Mac's, a few miles from the campground and one of maybe 2 or 3 places in a 30 mile radius for gas / water / ice or food of any kind. Basically a house with a gas station, no sign, and awesome awesome fried chicken. Anyway everything from here was fantastic from the chicken to the sides and the potato wedges. Always some locals hanging out at the tables and chairs and a busy parking lot, as I said this is really the only store or meeting place of any kind for miles in every direction, and they seem to be getting semi-famous for their chicken, which in my opinion was much better than Wayside, and seemed fresher, crispier, more golden brown, juicer, just in general more pride taken in the food. Awesome sides too. Nothing fancy, just made with care in that southern way with plenty of mayonnaise and several notches higher than your average Philly deli salads, the potato salad especially. Stopped in on the way out to fill up on gas, coffee, and a chicken biscuit with egg for something like $2. Delicious.